Grand Hotel isn’t just grand. It’s magnificent. Normally discussion of a show’s music jumps first off the page in a review of a work staged by a regional leading musical theatre presenter. In the case of Luther Davis, Robert Wright and George Forrest’s Grand Hotel, with additional music and lyrics by Maury Yeston, running though November 8 at Lyric Stage in Irving, the set warrants first mention. Designed by John Farrell, originally designed and built for Pittsburgh Civic Light Opera, it dominates the full playing space of expansive Carpenter Hall beneath a resplendent 1928-style chandelier. 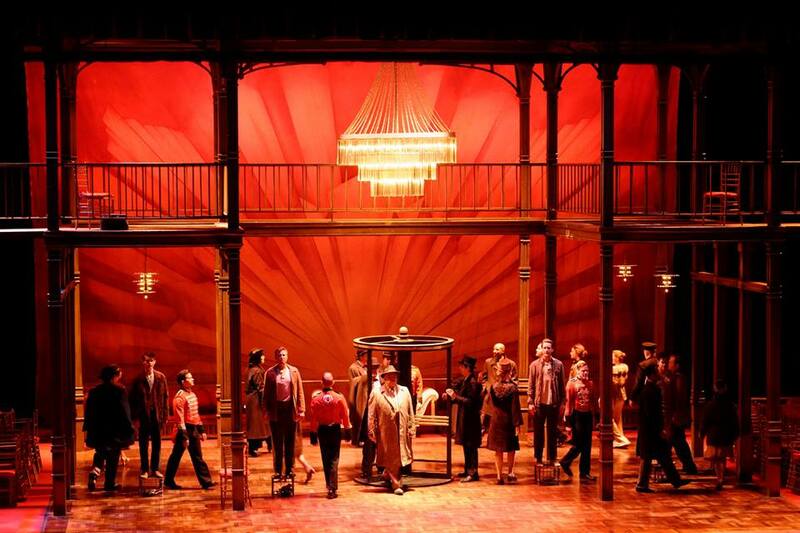 Displaying mesmerizing opulence in red velvet swag and dusky hints of lurid affairs and financial shenanigans from its sweeping second story railed balcony to dimly suggested hallways leading far upstage, the set creates a regal, imposing backdrop for every scene in the show. It’s the kind of set to appreciate even if performances disappoint (which they don’t here, not by a long shot). Stage director/ choreographer Len Pfluger, always an asset at Lyric Stage, makes apt use of every inch of the playing space and weaves his dynamic cast of thirty plus performers effectively through moments of high comedy, realism, romantic interlude, soul-baring anguish and expressionistic fantasy with Tommy Tune-inspired flourish. Grand Hotel isn’t just another sitcom of a hotel romance with naughty bits, emerging jazz artists and flashes of inspired dance by leggy girls. It reveals a world of desperation and hope, where rich and poor teeter elbow to elbow on icy edge in 1928 Berlin before Nazi Germany’s emergence and the Stock Market Crash turn the world into a very ugly place. The hotel lobby setting drives all twenty scenes forward. It’s never static, always bustling along with the revolving entrance set piece that floats in from upstage or the hand-carried “barre” that moves downstage to define freestanding hotel locations. The most suspenseful theatre scene I’ve watched this year takes place near the end of Act One, when the financially challenged, opportunistic Baron Felix Von Gaigern (Christopher J. Deaton) climbs outside the railing on the second story balcony to creep perilously across its full length in half light to enter another guest’s room. Deaton is a strong singer for this type of multi-dimensional work that Lyric Stage frequently mounts, as clearly demonstrated in the Act One finale duet, “Love Can’t Happen”. Watching him climb out over the balcony railing to inch across its length with no safety harness visible, a bold, unanticipated demonstration of agility and risk, astonishes the viewer and whets the appetite for the romantic duet he masters eloquently with Elizavera Grushinskaya (Mary-Margaret Pyeatt). Although some singing voices are more powerful and tuneful than others, every actor cast in this show brings a dimensionality and flair to his or her role that makes them “right” for the part and “right” for the ensemble. Of particular note is character actor Andy Baldwin, playing the health-challenged bookkeeper Jew Otto Kringelein. He creates such an unforgettably empathetic character through his unique blend of physicality and acting that his less than classic musical theatre voicing of “Who Couldn’t Dance With You” makes the character seem more real than if he were a Julliard graduate with perfect tone, pitch and vibrato. 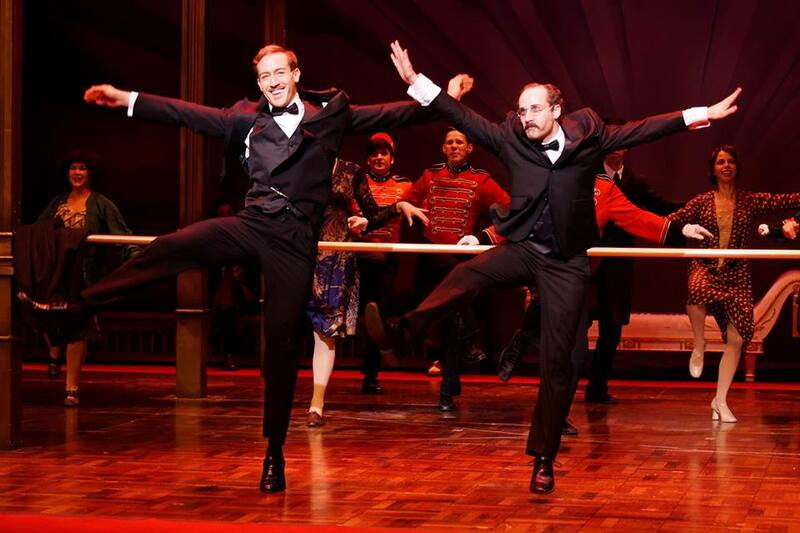 An enchanting performance, at its height in Act Two dancing with the Baron in “We’ll Take A Glass Together”. 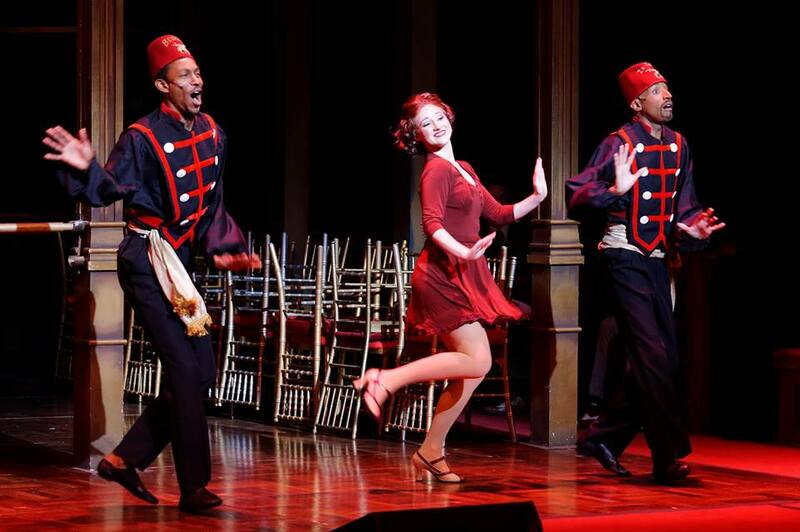 Outstanding debuts at Lyric Stage grace the production. 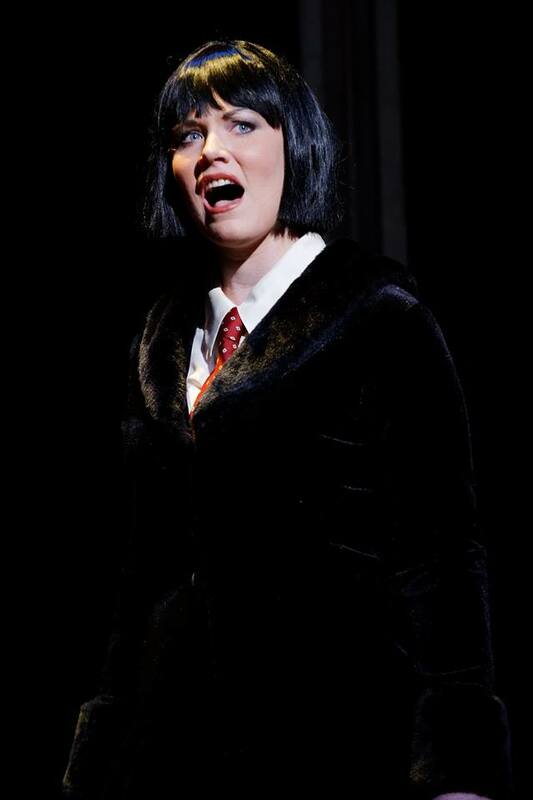 TCU senior Taylor Quick dazzles as the enterprising ingénue Flaemmchen, outstanding as a singer, actor and dancer. Barry Phillips as predatory businessman Hermann Preysing brings dramatic depth to his role, never descending into caricature as his desperate ploys escalate him towards disaster. The mysterious lesbian Raffaela, confidante to aging prima ballerina Grushinskaya, gets a rich, riveting realization by Lyric newcomer Jacie Hood Wenzel, adding an element of dark, surreal anguish to the melting pot of tomfoolery and expressive emotion wafting across the stage. The world grows harder and colder as the musical proceeds, with hopes dashed, fortunes lost, hearts broken and babies born. All the while Jay Dias conducts Lyric Stage’s phenomenal 32 piece acoustic orchestra with defining style and clarity, the backbone of the show its music with soaring, complex tunes representative of the era and always, always, so pleasing to the ear with Carpenter Hall’s acoustics. 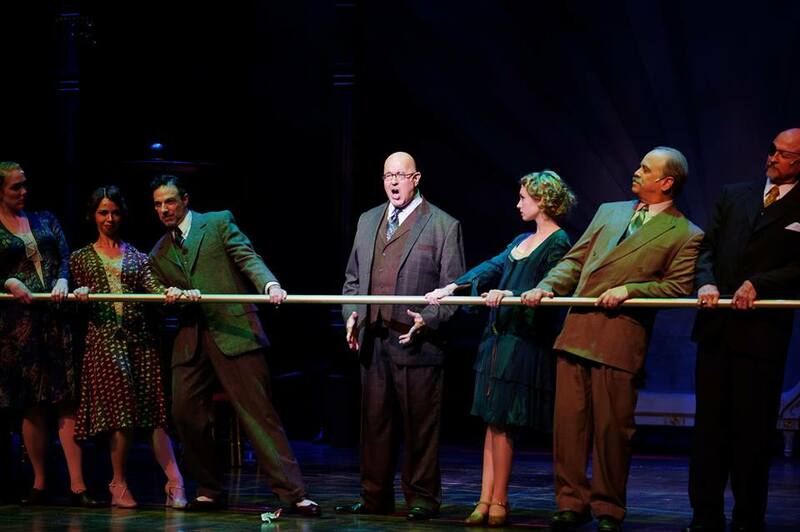 Lighting Design by Julie N. Simmons and and Sound Design by Bill Eickenloff. Costumes coordinated by Margaret Claahsen. Grand Hotel continues November 5, 6 & 7 at 8:00pm and at 2:30pm November 8 in the Irving Arts Center’s Carpenter Performance Hall, 3333 N MacArthur Blvd, Irving, Texas.